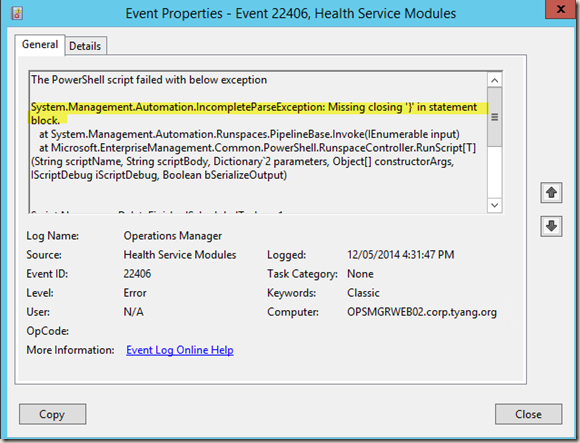 System.Management.Automation.IncompleteParseException: Missing closing ‘}’ in statement block. Needless to say, the script runs just fine manually on the agent, so it is bug free. Took me a while to day to figure out what the issue is. Did you put the script in the MP fragment or a separate file? I put it in a separate file and use $IncludeFileContent to embed the script into the fragment. Yes, it works with the empty line at the end of the file. I also use $IncludeFileContent. Using the Microsoft.Windows.PowerShellWriteAction Module in an Agent Task. When executing the Task it simply said “No output”. Nothing more. No DEBUG-Messages, no error log entries, nothing. I started reading the docs. Found for Module Microsoft.Windows.PowerShellWriteAction. Then I got this strange Errormessage “System.Management.Automation.IncompleteParseException ….” . Running the script on the commandline, no error, works fine. At the end I asked BIng ( yes, really) and found this blog entry. So again, thanks to Tao ! I found the XML-Tag “StrictErrorhandling” for the PowerShellWriteAction Module. Settign this true enabled the error-messages. If omitted it defaults to false and when running into the error we are discussing here, you simply see “No Output”. This is a silly problem. 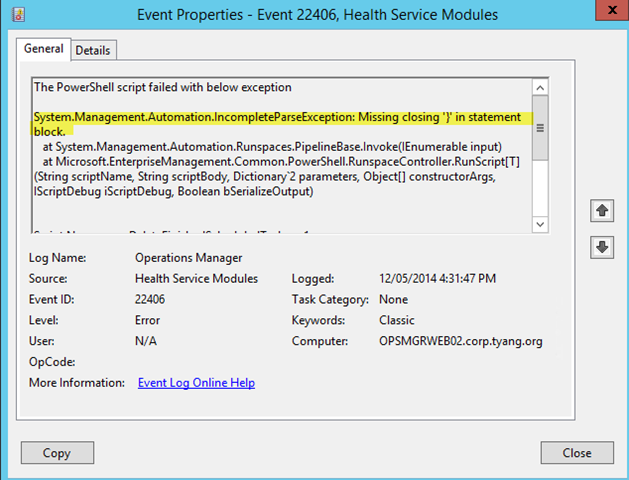 SCOM can be very fickle with scripts. I had a similar problem, but my problem was that I had a Remove-Variable function as the last line in the script (for testing). Once I removed that line, everything worked. Tao, thank you – you just saved me 2 hours on a customer’s site. you just save my life! !